So, how many of us think we can name a decent number of countries where cricket is played? I would suggest that, after reading this terrific book, we will be surprised at some of the bizarre places where the game is enjoyed. We know recently that Afghanistan and Nepal are making a name for themselves but, if you want to know about the game in, amongst many other places, Ascension Island, Cuba, Israel, Kiribati, Slovenia and Vietnam, this could just be the book for you. 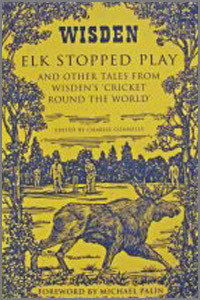 Drawing on extracts from Wisden where the seventy-five plus countries mentioned within the book have made it into the hallowed tome, this is a most interesting and fun book expertly edited by Charlie Connelly, a man who also appears to love cricket and travel. The different writers whose articles have appeared in Wisden have sensibly, in the main, given their readership an idea of where some of the places actually are in the world. Working in travel, maybe I am digging a slight hole for myself here but maybe the politest way of putting it is that I was pleased that the Wisden 2004 article on Nauru mentions it as a Pacific island... Others were less difficult to place but it does show how widely the game is played. I suspect also that, with the wealth of information within Elk Stopped Play, it may have unearthed one of the quiz questions in the Wisden Cricketer Christmas Quiz. A shame that I only found it out after the closing date but never mind. The book is fascinating and a thoroughly good and enjoyable read. I am very grateful to Mark Harrison for sending me this book. He probably knows of my love of cricket but, less likely, of travel so this is the ideal book for cricket-loving travellers. And who better to write the foreword than Michael Palin? Having looked through the book at the countries I will be visiting this year, I find myself hastily re-planning my days out to find the grounds - and, I believe, in some cases just fields/parks - in Austria, Croatia and, beginning shortly, in Iceland. Christmas Island, though, may be a little longer.